‘Future in the city’ indeed, and so is the blockchain! Even though we haven’t yet decided on how to best utilize this tech in a safe manner, its still here and it’s part of the future. That’s something the diverse panel that gathered in Moscow City on July 18 all agreed on. However, there would be no discussion in the first place if it was all that plain and simple. So, here’s our short take on the top issues brought up. It became obvious where the discussion will be heading as straight after CEO of Ripio Sebastian Serrano called the blockchain a magical book, Edward Gurinovich of Expload replied that he doesn’t understand why everyone’s trying to “shove” blockchain into everything. According to him, only two areas of our lives require the technology and those are finance and gaming industries. Sebastian jumped to disagree by saying that blockchain is essential for creating new ideas and markets. While an even stronger statement came from Dmitry Ufaev of Bitfury as he straight away told Edward that “you are wrong!”. According to him the technology enables to set up an undisputed registration of ownership which could be vital in less stable countries where official documents can be tampered with. Another scenario could be when an entire archive needs to be secured that would be constantly updated. Even though one of the panelists pointed out that a flash drive could do the job, Dmitri pointed out that security of that flash drive would become a real headache to its owners. The panel then went on to discuss a few of the benefits that the blockchain may bring to the world. “Anywhere where trust is needed blockchain could be used” said Dmitri, adding that corruption will be minimized as the processed is governed through an algorithm. Anton Kolonin of SingularityNET added to that by saying that in order to achieve such noble goals the blockchains “source code should be opened” to provide full transparency. He also weighed to an earlier argument about applications of the technology, saying that copyright issues could easily be solved through blockchain. However for the technology into mainstream use, the current system of mining should become defunct, according to Anton. The discussion then moved on to mull over the different technologies that can be part of the blockchain system with some participants sounding support for the Proof of Ownership with Dmitry saying that miners are unlikely to go out of business as they validate the technology and cryptocurrencies. He added that Proof of stake, on the other hand, would create high stakers that would reap the benefits at the expense of the rest and thus compromising the network of a cryptocurrency, potentially the bitcoin. Anton replied to that by saying that concentrating the mining power would be like “shooting yourself in the foot” and that Chinese bitcoin mining giants would never do that. 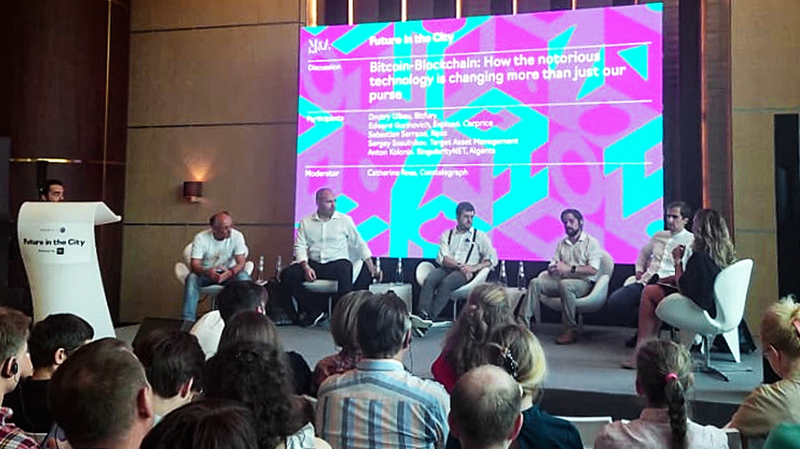 Next, the panel went on to discuss digital currencies and exchanges with Sebastian leading the way by saying that people should now begin to realize the need for tradeoff when choosing between centralized and decentralized exchanges. Centralized ones are more vulnerable but provide better speeds while decentralized ones do take longer, and the exchange rate may be less favorable but at least the funds are much safer. Regardless, centralized exchanges “do have a future as they are programmable” according to Sebastian. Sergey Sosulnikov from Target Asset Management added to this point by saying that regardless of which exchange to use, even some bright and educated individuals may still find it difficult to invest and trade. He also added that due to the volatility of the market, from the professional point of view, he would advise not to invest more than a certain percentage of income that an investor would potentially not mind losing. Also, he sees cryptocurrencies and mainly bitcoin as a long term play. A question from a lawyer in the audience has also brought up another interesting topic of regulation to which Dmitry replied that some regulation is needed but not the one that would forbid or restrict the activity of the technology. He also admitted that current legislation suggest that lawmakers have no clue about what the technology is. Those words came as a surprise because a week earlier I heard almost the same notion during a discussion between the Wikipedia Founder Jimmy Wales and CEO of Waves platform Alexander Ivanov. However, this time the participants have called for governmental sandboxes to be provided to develop new technologies. At this point, the Moderator, Kate Ross of Cointelegraph had to intervene and halt the discussion as it exceeded the allocated time by 20 minutes and to be honest I didn’t even realize it was the case. Special thanks go to PAO “City” (ПАО "Сити") for organizing the two day event, and stay tuned for our report on how the second day went.